3) Speaking of postpartum muffin-top abuses, I have continued to crave sweets like crazy, although my little guy is now 5 weeks old. Isn't that odd?! I don't recall having lasting sweets cravings with past post-pregnancies. My weakness is dark chocolate and mint combinations. At least Christmas is over-- when all of those deliciously evil dark chocolate minty barks were all over the store shelves! I have a much easier time resisting peeps and cream eggs! 4) During the middle-of-the-night feedings I've been watching Frasier re-runs to keep my eyelids from drooping shut. It's one of those shows I never watched back when it aired, and it is funny! Since I've been watching it so much I've been seeing all these scenes where the characters are chatting away in a coffee shop. All of these coffee-house scenes are making me crave snooty high-brow over-priced deluxe coffee complete with a size in Italian and foam on top. I was telling Kevin about it, and he suggested I just break down and buy one to get it out of my system. 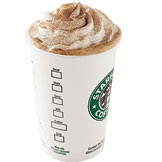 So I indulged in a Cinnamon Dolce Latte from Starbucks last weekend and--YUM!! Unfortunately my indulgence has had the opposite effect and now all I can think of (aside from minty chocolate, that is!) is when I can get another! Just what I need--another muffin-top enabler! 5) Another thing I've been loving (Thank God this one isn't edible!! I don't think I could handle any more cravings!) are Aden + Anais swaddlers. These things are AWESOME! I am all about the over-sized swaddling blankets and these ones deliver! They are huge! And the best part is that they're light-weight so babies won't overheat. If you happen to have a baby and are in the market for a decent swaddler, check these out! I wish I had known about them with my past babies! 6) On the topic of baby products, I broke down and picked up the famed Sophie the Giraffe teether. I had heard this thing was the king of all teethers, so we shall see! I have never in all my life plunked down so much on a measly piece of rubber, so I'm hoping it'll be worth all the hype! Has anyone ever used one? 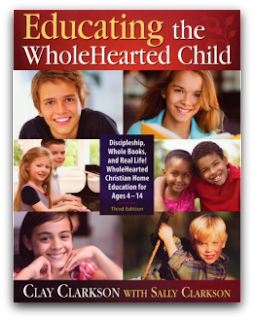 7) I'm in the market for some books/materials to freshen up our religious homeschool studies. 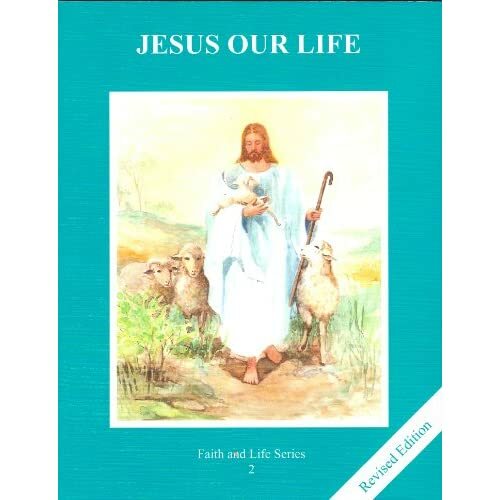 As our core book, we've been using Jesus Our Life, along with a few other supplimental books, but I'm feeling like we could use a change of pace to liven things up a bit. Any suggestions for the 5-7ish age range would be very welcome! Spring in Connecticut...a tad too white for my liking! It's the first day of Spring, but it's looking a lot more like the middle February what with the blanket of snow and blanket of ice coating everything. But in the melty patches I see green instead of brown and the spring birds are returning to my feeder, so I know the warmer weather is on its way! I understand why writers and poets so often equate spring with hope! It's that excited waiting--the anticipation and belief in that which we cannot see. I love how Easter is right smack dab in the middle of this transition from winter to spring. What better time of year to celebrate the resurrection? ...about motherhood. A lot. I'm happy to share that we've added a new little life to our family! 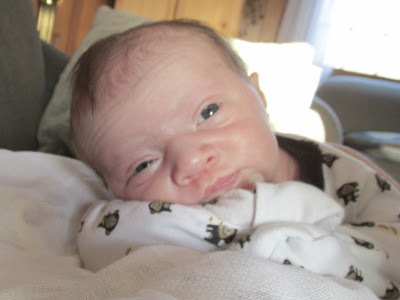 On February 12th I held my sweet & tiny little son,Thomas Blaise, in my arms. Just 6 pounds 1 ounce and 18.5 inches long! He's by far the smallest baby I've ever had and there were lots of scares throughout my last month of pregnancy about his health (all unfounded, thank God! ), based on his small size. I thank the Lord every day that he's healthy and growing by leaps and bounds! I must admit I've always taken my healthy pregnancies for granted in the past. A miscarriage and this most recent scare has certainly changed all of that. So I am loving all of the newborn snuggles all the more in the wake of the fears I endured. At the hospital--now a family of six! 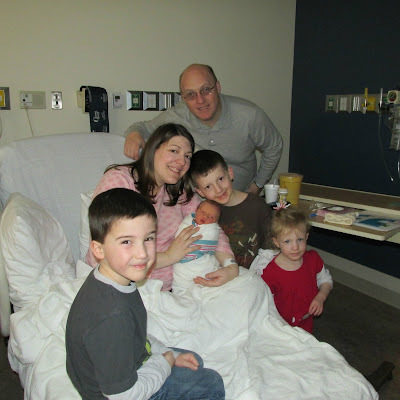 Our family is still adjusting to this brand new little person we've added. We're finding new routines and new rhythms. It's definitely changed our homeschool days! I'm also finding I have a LOT less free time! I know that should seem fairly obvious, but I'm still adjusting to this change. I realize what a gift that free time is and how I need to use it wisely these days! For so many things...for my sweet little boy, for the way my children have adjusted so well to their lives being upended by our new addition, for the ability to stay home and see all of the transitions and "firsts" each of the kids go through, for a husband who pitches in when I can't keep up on everything and for 2 glorious nights in a row of Thomas sleeping 6 hours between feedings! I feel so very blessed. I have a newfound love and respect for the existence of the "30 Minute Meal!" I am all about the quick meals that require little thought or preparation these days. And alleluia for leftovers! Hooray for clothes that don't require ruched sides and stretchy belly panels! My clothes isn't exactly the size or fit I'd like them to be just yet, but hey, at this point I'm just thankful to have a little variety after 9 months of donning the same ol' preggie-duds! I never thought I'd be so happy to see my corduroys and cotton shirt I've had for years! A whole 'lotta nowhere! Newborns aren't exactly good for one's social life. But that's ok, I'm kind of a home-body anyway! When it'll finally feel like spring around here! (See above description of snow and ice.) I'm itching to get out there for some walks in the fresh air sans snow boots! Ummm...see above notes on skimming magazines in 1/2 hour stints! If I try to read anything deeper than that my sleep-deprived mush-brain just can't seem to process and my eyelids grow heavy. Again, it's all about the seasons with these things! But I also have big plans for future reads. Some Barbara Kingsolver will be in that future. I've heard so many good things about her books and have yet to crack one, aside from an audio book I couldn't get through for more than 10 minutes since the narrator was just AWFUL. I'm also verrrrrrrry sloooooowly working my way through Educating the Whole-Hearted Child by Sally Clarkson. I've been in homeschool-refining mode lately and really felt the need to read something inspiring. I always get in a bit of a funk at some point in the school year, and have been feeling badly that we've had so many chaotic weeks what with the move and the baby. Encouraging homeschool authors to the rescue! It will warm up for Easter, but it's not looking likely at this point. It's gonna be one cold egg hunt in Connecticut, me thinks! Future house projects! I have grand plans, many of which involve scraping granny-esque wallpaper and painting. I'm also really looking forward to seeing what types of plants will sprout up at this new house. We moved in December, so I have no idea what's planted here! Patience. (I hope, anyway!) Patience has always been a struggle for me. Lessons on trusting more. Time management. Growing as a mother and homeschooler in a season of change. Refining my goals and getting in touch with what really matters most to me. Winter--especially Lent--has always been a big season of introspection for me, and this year has been no exception. I think all of the huge changes I've been through--moving, having a baby--have helped me grow and lean on God a lot more. Although I'm often resistant to change, I can start to see some of the positive results already. It's when we're stripped bare emotionally that the real growth can take place, you know? How to work quality prayer time into my newly busier days. I used to love starting the day with a good chunk of time spent in prayer, but with a newborn it's been in bits and pieces, which I don't like. I feel myself longing for that solid chunk of time to really "dig in" and feel a little off-kilter with these shorter bursts here and there. Any suggestions?? How true that no good comes from comparison! I need to remind myself of this often, when I'm feeling "not enough." A little St. Paddy's Day toast with green punch! The littles keeping themselves entertained on the cold winter days!